DOGPAW is a non-profit organization that creates and maintains four off-leash dog parks in the Vancouver, Washington area. They believe dog parks are a vital part of the community’s quality-of-life by giving dogs and their owners places to run, walk, play, and thrive. DOGPAW advocates for off-leash dog parks, working to find land, obtain permits, build, and maintain safe dog parks that include all the fun things dogs love. DOGPAW came to Ichor in 2017 in need of assistance with their “SaveDOGPAW” campaign. With Ichor’s assistance, DOGPAW successfully met their goal of raising $100,000 for park expenses, raised awareness in the community, and increased membership by more than 20%. DOGPAW came to Ichor for a total redesign of their website. They had set a $100,000 “SaveDOGPAW” fundraising goal, and needed a website that could help increase awareness. DOGPAW’s parks are not tax funded, but that message wasn’t clear to the public. DOGPAW also need to raise public awareness that funds were needed to keep these dog parks open. DOGPAW’s website had to accomplish several goals. First and foremost, the site needed to be visually attractive and engaging to draw in new members. Functionality was also a top priority because DOGPAW manages memberships, online donations, and volunteers through their website. Their old website had very poor functionality, which led to user confusion and frustration. Membership sign ups and donations had been steadily declining over the years, and events weren’t being promoted well. Attracting more business and corporate sponsors was also an important component of their new website design. Ichor’s solution was to create a clean, easy-to-navigate website where people could learn about DOGPAW, become a member, donate, and learn about upcoming events. The website featured bright, fun images, precise copy, and a straightforward call-to-action that guided visitors to donate. The design both attracted visitors to the page and improved membership and donation processes. Members and donors were able to easily and efficiently sign up, and DOGPAW’s administrators have quick access to records. Since the launch of DOGPAW’s new website, the “SaveDOGPAW” campaign successfully raised over $100,000 and memberships increased by more than 20%. The new website Ichor built is essential to DOGPAW’s continued growth and success as a non-profit organization. Ichor proudly continues to support DOGPAW as a sponsor and business partner. 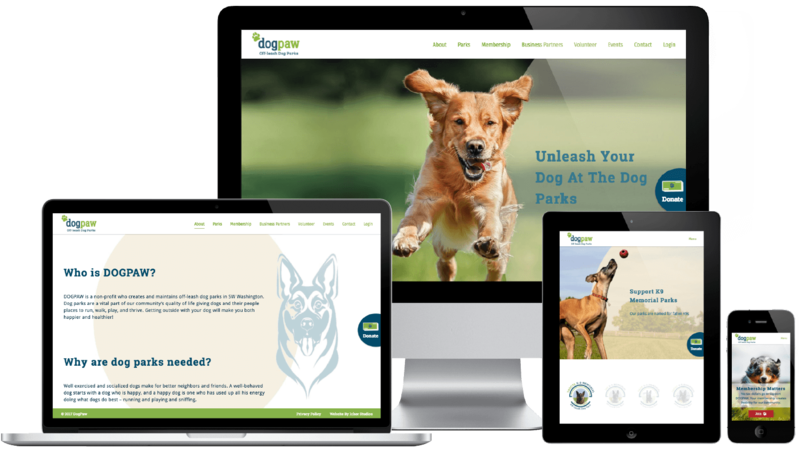 DOGPAW Off-Leash Parks was in desperate need of a new website. Our old website was tired and delicate. Jen from Ichor Studios had the patience to work with us and create a fantastic, easy to use website. Our new website has been one of the key components to getting DOGPAW Off-Leash more visibility and awareness in the community. I highly recommend Ichor for your website build. Thanks Ichor!